Here we go ONE MORE TIME IAU/WGPSN (International Astronomical Union/ Working Group for Planetary System Nomenclature) and PLUTO Task Force.... Hope You Have Your Plutonian System Surface Feature Themes and Suggested Names List Ready, because PLUTO, CHARON, NIX, and HYDRA are about to have a Family Re-Union straight from the Underworld of Ancient Mythology. Eat Your Hearts Out THANATOS and HYPNOS. Our Best Regards to the Johns Hopkins University Applied Physics Laboratory (JHUAPL), the Southwest Research Institute (SWRI) , Lowell Observatory , and the NASA and Jet Propulsion (JPL) Teams for a Task WELL DONE, and to CICLOPS and the Global Community. The Year of Pluto - The "NEW HORIZONS" Mission reaches PLUTO, and Brings Humanity Closer to the Edge of the Solar System. Original Image of the Planet Pluto taken by the "NEW HORIZONS" Spacecraft on July 14, 2015. The International Astronomical Union and Working Group for Planetary System Nomenclature (IAU / WGPSN) have Officially Adopted the Names of Mountains and Peaks from J.R.R. Tolkien's fictional fantasy novels for the Official Naming of Mountains and Peaks (MONS and MONTES)on the Surface of Saturns' Major Moon TITAN. 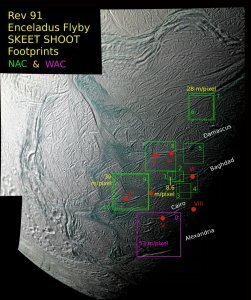 Best Regards to CAROLYN, the CICLOPS CASSINI IMAGING TEAM and their Colleagues, as Well as the Members of the IAU / WGPSN, USGS Astro Branch, JPL/CIT, NASA, the European Space Agency, and all our Sector 6 Members and CICLOPS Participants. The name ARRAKIS has officially joined SIKUN and CHUSUK as a Planitia feature on the surface of Saturn's major moon, TITAN. ARRAKIS Planitia was officially adopted on April 5, 2010 by the International Astronomical Union. The names Arrakis Planitia, Polaznik Macula, and Uanui Virgae have been approved for features on Titan. For more information, see the list of Titan surface features and the map of Titan in the Gazetteer of Planetary Nomenclature. ENTRY_POSTED_BY Jennifer Blue on Monday, April 5, 2010 at 14:18. FILED_UNDER Planetary Nomenclature. This one should light up a few faces, young and old alike. Best of Regards, and Best Wishes to everyone. Well, here it is everyone..... SIKUN, a planet from Frank Herberts' Novel and Series "DUNE" has made it on the surface of Saturns' largest moon TITAN. The descriptor term labyrinthus has been approved for use on Titan with the theme "Names of Planets from the Dune series of science fiction novels by American author Frank Herbert (1920-1986)." The name Sikun Labyrinthus has been approved for the feature located at 78S, 29W. ENTRY_POSTED_BY JENNIFER BLUE on Wednesday, January 6, 2010 at 08:26.
and to all who have participated in unveiling the hidden beauty and wonders of our known Solar System, and our Cosmic domain. KRAKEN, SANTORINI, ONTARIO and XANADU, hold on tight because here comes CALADAN, ARRAKIS, and the rest of the "DUNE" gang! Keep the great images coming CICLOPS Team, and we'll keep submitting the names according to IAU/WGPSN Assigned Planetary Surface Nomenclature Categories and Themes. Well, not only do the great images keep coming in on time as scheduled, but it just gets to show that the genius of scientific minds can always create a treat or two for everyone of all ages. The young children, and old alike, are just going to love these images, thanks again to Caroline and the CICLOPS Team. This is great stuff to get our young and future generations interested in Space Exploration. SLEEPY HOLLOW.... Eat Your Heart Out! Thanks Irving Washington and Bram Stoker, for the almost two centuries of keeping everyone looking up.... but here we are.... HALLOWEEN has just gone COSMIC. You just never know what kind of surprises may await. A descriptive sentence or two was also attached with the Name of each "DUNE" planet as well. In addition, a list of DUNE "Houses" (ex: HOUSE ATREIDES), and a list of DUNE Characters were also attached to the list of DUNE Planets. So, If you can't wait to see "ARRAKIS" Planitia on the surface of Saturns' largest satellite, TITAN, think about how I feel, when I've been doing this for 20 years. Here's the secret; YOU JUST NEVER GET ENOUGH WHEN YOU KNOW WHAT VALUE IT WILL HAVE FOR ALL FUTURE GENERATIONS. IT JUST SIMPLY UNITES ALL CULTURES AND ETHNICITIES OF HUMANITY, AND IT DOES SO AT A COSMIC SCALE. My daughter Vicky is a big fan of the DUNE Series, and as other young children around the world, she too will one day be amazed at what beauty can arise out of a single image taken by a planetary mission probe, and where it can lead humanity. - My Sincere thanks to the CICLOPS Team, NASA, JPL, the USGS and the International Astronomical Union, for their outstanding collaboration of over two decades, and to the CICLOPS Alliance for their interest and enthusiasm that they have shown regarding the CASSINI / HUYGENS Mission to the Saturnian System. PLANETS from Frank Herbert's Novel "DUNE". Not only does my daughter Vicky love DUNE, but after spending sometime preparing a list of names and suggestions for submission to the IAU and USGS Astro Branch a week ago, and explaining to her how the IAU and CICLOPS Team cobtribute to future generations, my daughter is starting to love the IAU and CICLOPS team as well. "Father!, The Sleeper has Awakened!" For what are images to the human eye at the present time, shall be senses that will capture the imagination of the human mind with great magnitude in the future. And in so being, will hold humanity breathless at the grandeur that awaits us. Some really TITANIC images that are going to get better and better, until the day comes when we hover above CHUSUK, LIGEIA, ONTARIO, SANTORINI and the KRAKEN. Best Regards, to the CICLOPS Team, and the Alliance. Who says it doesn't pay to be a scientist? crater on Mars, and right in the grasp of historical CASSINI as well. Keep those great images and data coming CICLOPS Team !